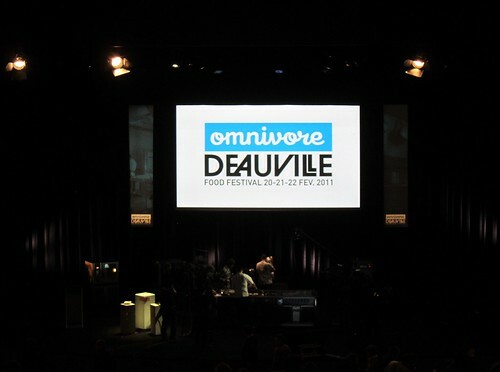 But what the heck is Omnivore? Omnivore is a French Food magazine dedicated to young and creative cooking which is at the same time conscious of locally rooted as well as seasonal ingredients. I hope I got that right, but of what I saw, all those rather young chefs bring together avantgardiste creativity with the simplicity of fresh ingredients from the market. And being the modern magazine that they are, Omnivore also publishes a restaurant guide, without points and rankings – truly refreshing! Simple Bistro-like combinations are a welcome trend. 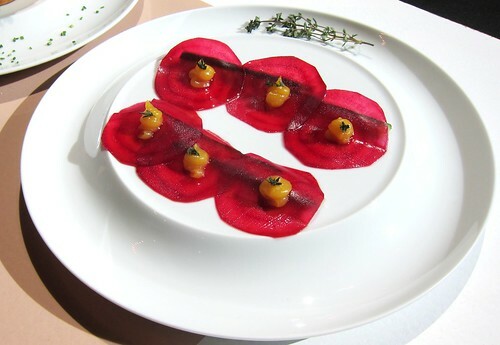 Here: beetroot, orange pulp and thyme by Russian Chef Ivan Shishkin of Delicatessen, a gastropub in Moscow. 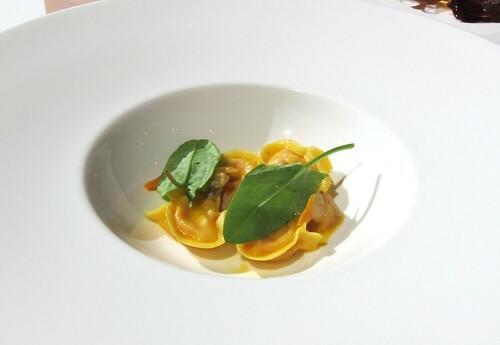 And the Omivore philosophy really hits the spot when it comes to current restaurant and food trends. Indeed, many of the young Chefs presenting their cooking are part of the Bistronomy-scene which is the dernier cri in Paris and other food spots on the planet. This style could be seen as simplified and deformalized fine dining, being fun and laid back without lacking quality ingredients and creativity – think of star-level Chefs having a cooking party between friends and you, as a restaurant guest, are partying with them. In Paris, this style is represented since long by Inaki Aziparte of Chateaubriand (who recently opened a second restaurant, Dauphin) as well as by Frenchie and a good handful of other restaurants. 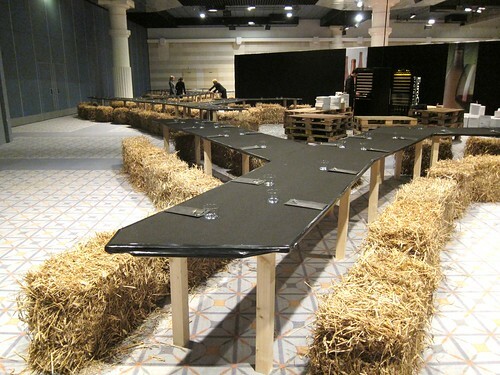 At OFF, Sven Chartier and Ewen Lemoigne of Saturne were the first to represent this current, demonstrating their interpetation of natural cooking with for example a simple chicken cooked in bread dough and charred vegetables (Sorry, no pics, but look here for example). It was a good introduction to the trend, even though this was seen as too simplistic by many in the audience. Anyhow this is a pretty exciting development for French cuisine which has been in a crisis for a long time. It seems like young chefs are responding to trends coming from restaurants outside of France such as David Chang‘s Momofuku of New York with it’s contemporary, ingredient-driven American cuisine or René Redzepi‘s Noma of Copenhagen with its natural intepretation of local produce. And maybe these Chefs in France are now about to reinvigorate French Cuisine in general and bring it to new highs. So we have Giovanni Passerini from the Parisian restaurant Rino. He is applying the principles of the Italian Cucina Povera to the not necessarly Italian ingredients he can find in Paris. Still: pasta are part of his repertoire. Then we saw young French Chef Bertrand Grébaut who learned with Passard and then earned a star at L’Agapé . He just came back from a long trip through Asia and is now going to open his own restaurant in Paris named Septime (name based on a Louis de Funès character). 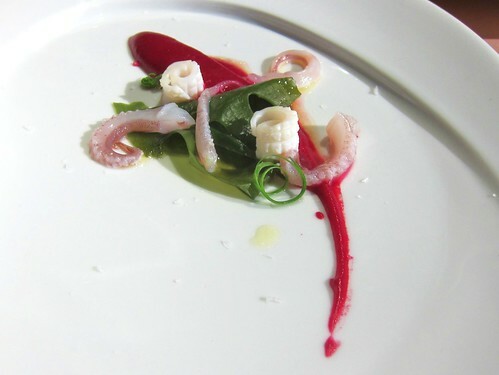 The compositions he presented were full of sense and seasonal freshness. A restaurant opening to look forward to, maybe we’ll get bistronomy at its finest level. 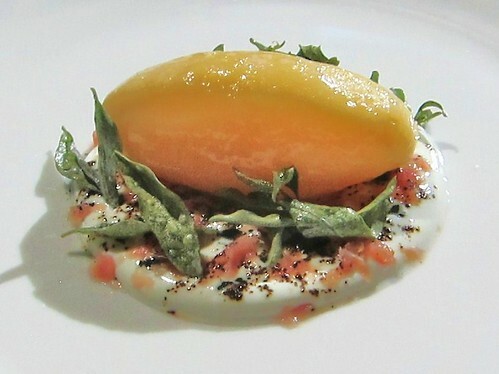 Onion roasted in “robe des champs”, Grated Gouda – old and young, smoked egg yolk, wild sorrel and Kampot pepper; one of Betrand Grébaut’s natural and seasonal, yet sophisticated creations. But as I said, this type of cooking is now present at young tables all over the world, to an extent that one can’t know anymore who is actually influencing whom. 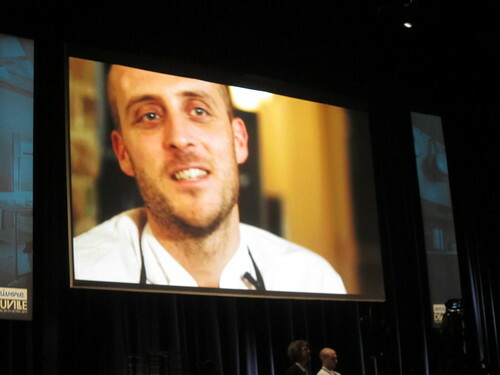 Take Christian Puglisi, a former from Noma who now owns Relae in Copenhaguen. It is incredibly fascinating and mind-boggling how creative his dishes are, even using ingredients anyone could get his hands on easily. He roasts carrots and potatoes, braises veal shanks and powders them with cocoa, nitro-freezes topinambour cream for dessert as if it was the most natural thing in the world. 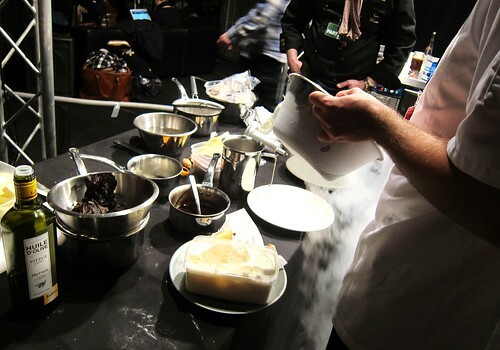 Getting a backstage taste of Puglisi’s nitro-frozen Topinambour-cream dessert with passion fruit sauce – delicious! More Creations of Puglisi can be seen on Very Good Food. Impressive dishes also came from accross the ponds. James Syhabout from Commis in Oakland, California demonstrated how fine dining is served in his humble neighbourhood restaurant with a few impressive dishes. Before opening Commis, James worked as Chef de cuisine at Manresa. But he also spent a few months in Europe at restaurants like the Fat Duck, El Bulli and Mugarritz… not a bad curriculum. One of the amuses or snacks at Commis. 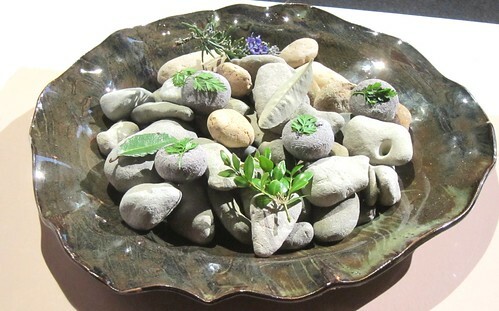 Not all are real pebbles. Those marked by chervil are actually Parmesan cookies rolled in vegetable ashes. 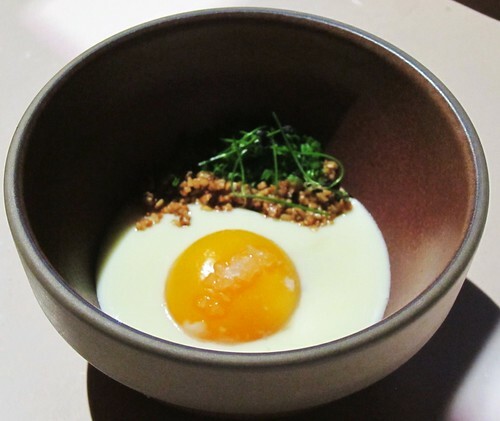 What a clever dish: egg yolk is poached at 64°C and dropped into a rich cream of onions. Underneath is some smoked date and on top some oatmeal: a perfectly simulated breakfast and boy did I crave that luscious thing when I saw it on the big screen. 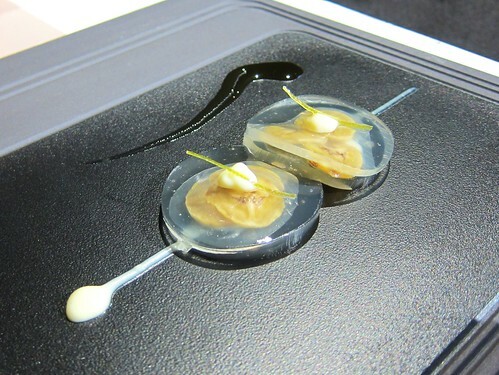 Also Ben Shewry, head of the Melbourne restaurant Attica impressed with his sensibility vis À vis nature, putting ingredients back into their environment. 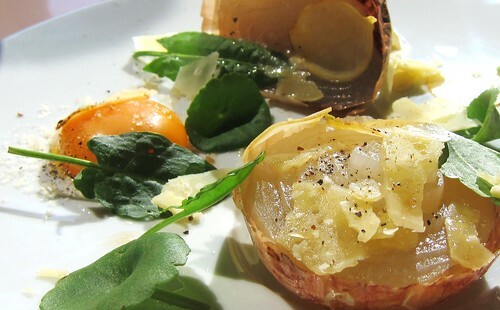 What a great idea for example to cook potatoes in between layers of earth (!). It actually puzzled me that no one ever thought of it before (?). Ben Shewry litterally puts the stage on fire. Potatoe cooked in the earth it was grown. Brazilian chef Alex Atala of D.O.M. in Sao Paolo is the indisputable pioneer of fine dining in his country and a fierce defender of locally sourced ingredients. But since the fine dining history in his country isn’t as old, he has to find himself usable ingredients in the Brazilian environment, mostly in the rain forest. 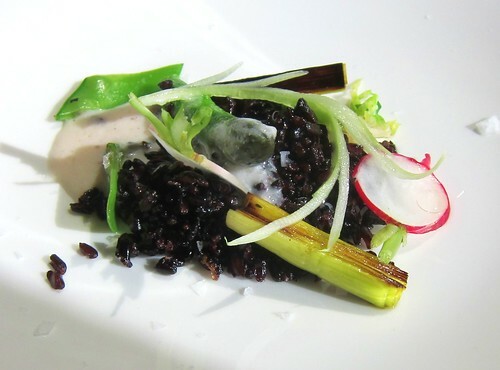 He uses a Brazilian red rice variety, nearly charring it for obtaining playful textures. This dessert is an example of how Atala is using Brazilian ingredients he discovered for fine dining. The dollop of caramel next to the banana in lime-gelatine is flavoured with the essence of the Priprioca root. As he explains, it has an aroma similar to musk. Finally I also have to mention André Chiang of newly opened Restaurant André in Singapore. Although I didn’t take any pictures, his presentation was more than impressive. His dishes speak purity and perfectionism and I’m pretty sure there will be lot more to come by this young fellow. 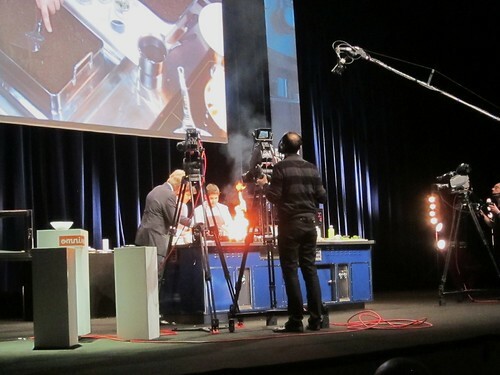 PS: Also check Stéphanie’s great wrap-up on OFF on her blog Cookcooning (in French). Thanks a lot for this post. So good to go back to the OFF through your words and very nice pictures. Was our pleasure to have you with us. See you soon here or there. Bises from Paris. Merci Stéphanie! The pleasure was all mine! Great company indeed! Hope to see you guys soon. Bises! Thanks for the shout-out link to Hungry Amateurs, and on top of that, for the great write-up and photos! I’ve run across BTC via several Google searches in the past but never read with regularity – any chance of an RSS feed in the future? My pleasure. Actually, I’m not a tecchie, but there should be everything you need: RSS, Twitter, facebook – check on the right side of the page under “follow me”. Please let me know if something isn’t working.